I am learning a lot about yogurt--and I am really enjoying it. While Yoplait Light yogurts are some of my favorites as stand alone snacks or breakfast--through my affiliation with the Yoplait Light Swap Team, I am given the opportunity to look at yogurt outside the container and try various flavors in creative recipes. The best part is that I am learning to make some ingredient "swaps" to create healthier recipes using yogurt in ways that I never considered. In November, A Mama's Corner of the World was experimenting with raspberries--and Yoplait Light Raspberry Cheesecake yogurt. Our latest creation swaps Yoplait Light Raspberry cheesecake yogurt into one of our favorite muffin recipes to replace some of the oil and fat in our usual muffins. Want to try some? Preheat oven and prepare muffin tin. Preheat oven to 350 F. Place a paper or foil muffin liner into each spot on either a mini muffin tin or a standard muffin tin--or spray lightly with cooking spray. Mix dry muffin ingredients. Combine the flour, sugar, salt, and baking powder into a large mixing bowl and set aside. Mix the remaining muffin ingredients. To a medium mixing bowl, add the egg, yogurt, applesauce, butter, and milk. Whisk to combine. Add the wet ingredients to the dry muffin ingredients and stir until just combined. Add the mixed berries to the muffin batter. Fold in the berries to avoid cushing them too much. If using a mini muffin tin--it may be necessary to break up large berries into smaller pieces to give the muffins a better bite sized texture. Fill the muffin tins. Spoon the muffin batter into the lined muffin tins, filling each cup about 2/3 full of batter. Top with streusel topping. Combine the sugar, nuts and butter in a small mixing bowl and cut in the butter until the mixture is crumbly. 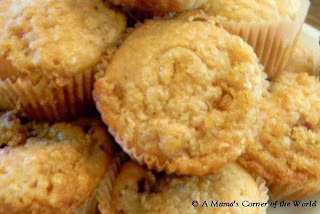 Sprinkle streusel topping evenly over the tops of the muffins. Bake and Serve the Muffins. Bake until the muffins are lightly browned and a toothpick inserted to the center comes out clean--excect for clinging berry juice or pieces--about 20-25 minutes for full sized muffin tins or 12-14 minutes for mini muffins. Serve the muffins warm. Disclaimer: As a member of the Yoplait Light Swap Team, I occasionally receive yogurt samples and gift cards to use toward the creation of my yogurt swapping recipes. As always, my opinions are my own and are not influenced by the brand featured.